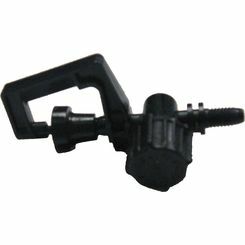 Toro T-FJQ16 Loc-Eze Figure 8 Clamp 5/8"
With water conservation becoming such a hot button topic, drip irrigation is fast turning into one of the most popular forms of irrigation. 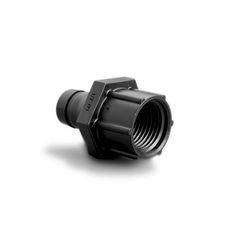 Offering low flow technology, the right drip fittings will make all the difference in your installation. Drip irrigation is powerful in more ways than one, and can be the perfect irrigation solution for you. 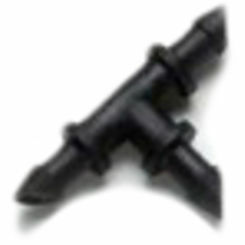 However, you cannot make a drip irrigation system work without fittings, drip tubing, emitters, and we have all the sprinkler fittings you need, right here at discount prices. What Are Drip Line Fittings? 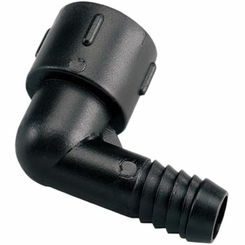 The main function of drip fittings is to allow for a convenient and flexible arrangement within your irrigation system. 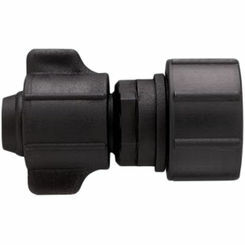 Couplings, elbows, adapters, flush caps, barb elbows and more make it possible to design a drip irrigation system in almost any garden or landscape, regardless of the shape, size, or plants you happen to be watering. 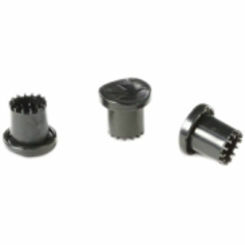 We even offer nozzle adapters to change the spray or drip that your system emits, further extending the range your system is capable of. 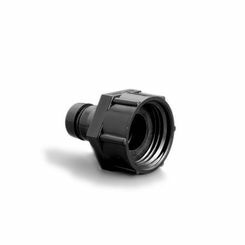 Overall, drip irrigation fittings—though not exactly integral to the actual function of your system—are the accessories that make setting up your drip irrigation possible; you simply cannot do without them. 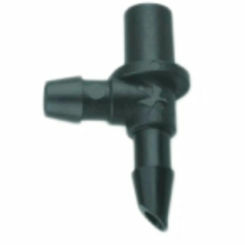 Tees - this fitting is used to create offshoots from a drip line. 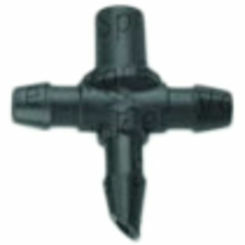 The drip irrigation tee is aptly named because it is shaped like a “T”. 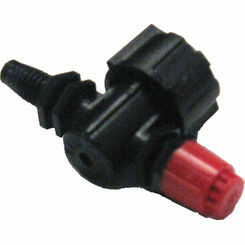 Place one at the end of a line and you can run two more drip lines off this fitting. 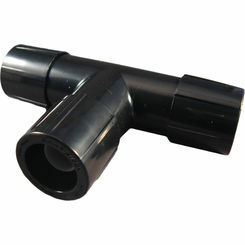 Couplings - also commonly referred to as “couplers”, this fitting is used to connect two drip tubes together. 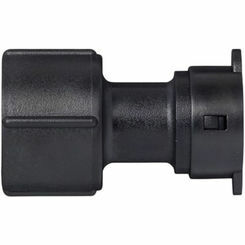 With certain couplings, you can connect same size lines, or with others, you can connect different sized lines. 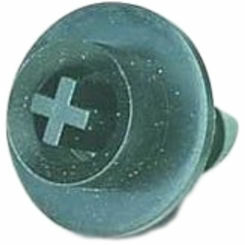 Make sure you get the right fitting for your purposes. 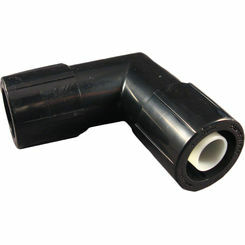 A coupler also allows for much more convenient repairs when you have maintenance issues like a punctured line. 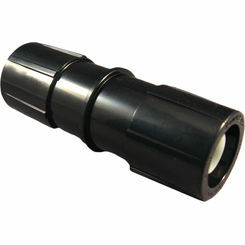 Adapters - in order to reduce the pressure when connecting one line to a smaller line, you will want a drip adapter. 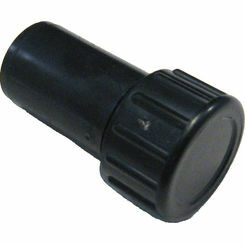 Make sure each side of the adapter corresponds with the sizes drip tube you plan to connect to it. Elbows - also referred to as “Ells” or “Ls”, the elbow is shaped like a right angle, making this fitting ideal for changing the direction of the line perpendicularly. It is ideal to run drip lines around the edges of the home and fencing, because it places it in a spot where people are less likely to step. You will want to use a drip elbow in a corner, rather than bending the line, because it allows you to create perfect right angles without kinking the line. 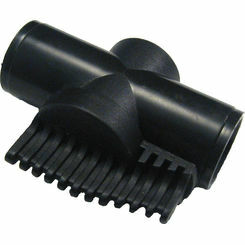 Nozzle adapters: Our nozzle adapters can be used with any SQ series nozzle and are very helpful for watering taller plants, shrubs and flowerbeds. Though they are only needed in certain cases, they are very important for adaptability and flexibility. Mesh Screens: Perfect for low volume irrigation zones, mesh screens filter water as to keep systems free of contaminants. 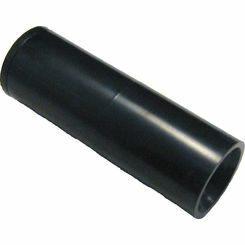 This improves performance and reduces the amount of maintenance you will have to perform on your drip irrigation system. 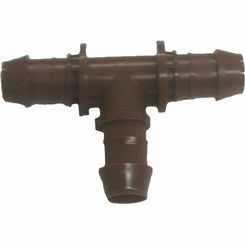 Compression Drip Fitting: Perfect for attaching tubing to accessories like elbows, valves, and filters, compression fittings are a major part of most irrigation systems. 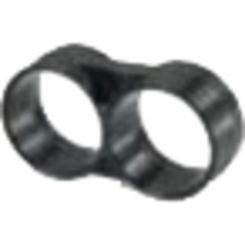 These allow tubing to go in multiple different directions while also providing a medium to manipulate the water as you will. 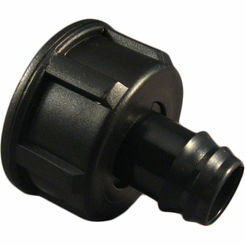 Browse through hundreds of options in drip fittings: Toro, Rain Bird, Orbit, Dig, and Irritrol. 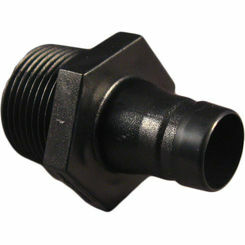 At the end of the day, drip fittings are a very important part of most drip systems. 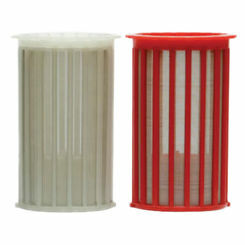 They provide the flexibility you need, as well as the water manipulation medium that is integral to drip irrigation; in other words, you need them, no matter what you think. 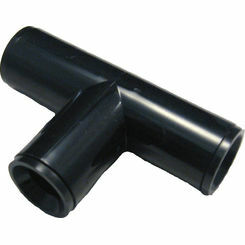 Fortunately, here at PlumbersStock.com, we offer the lowest prices and one of the largest stocks of drip irrigation fittings, connectors, and more. No matter your budget, regardless of what you are looking for, you should find the lawn and garden products you are looking for!